Thank you! We’re all very happy. Immortal Tango is a show illustrating how tango can go much further than the established conventions that the public is used to seeing. Being a popular (and initially completely social) form, tango has been through many changes over the years. But its essence remains the same – the connection felt in the embrace. The Immortal Tango company has five world champions amongst its fourteen incredible dancers; the marvellous voice of Antonela Cirillo and a band of five musicians. Choreographically, there are many moments of dazzling complexity, as well as others of simplicity and purity. Your last show, Tango Fire: Flames of Desire was at The Peacock last year. Will Immortal Tango be very different? 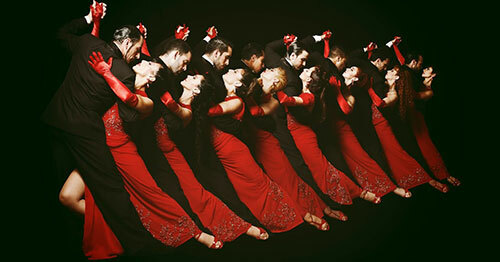 Tango Fire is an intense show, presenting a very pure form of tango, performed by an incredible team of artists. The idea for Immortal Tango came to me when I realised that many tango shows nowadays largely feature similar formats, plots or musical choices. So I wanted to show the world something different, something incomparable to other tango shows that avoided tango clichés. I wanted to reach people who aren’t familiar with tango, people of all generations. The result is an avant-garde, lively, delicate and fresh show that invites us to rediscover tango in new light. In some pieces we fuse other disciplines into tango. The music is rich and varied. The audience will see that tango is much more than certain classic movements – instead it is a way of feeling the music and of holding and connecting with each other. Is it difficult to make tango modern, innovative and relevant to contemporary audiences, while still keeping it pure and traditional in form? Tango is much more internal than external. Its magic lies in the internal journey the dancer goes through. We have to focus on this when creating new pieces. We mustn’t lose sight of tango’s essence. Tell us a bit about the social and political history of tango. Is it still important for artists creating work today? Like all social phenomenon, tango is directly affected by society and its changes over time. It’s no longer just danced among marginalised communities, as it was at the start of the 20th century. Tango is a faithful reflection of society’s transitions, advances and changes. The only thing that doesn’t change is feeling the embrace when dancing, which is the essential key to tango. Tango is a deeply passionate and sensual dance, with an intimate physical connection between the two dancers. What does tango teach us about love and romance? It is indeed passionate and sensual – but above all it’s a dance of connection and communication. Tango forces us to respect one other, to give one other the space to move, to avoid clashes and to take care of one other. It sharpens our perceptions and sensibilities and connects us more closely with ourselves and therefore each other. Many tango dance couples are couples in real life. Do you think your personal relationship with your dance partner is important to what the audience sees on stage? Yes, but this is not exclusive to romantic relationships. Gisela [Galeassi] and I aren’t a couple in real life – but nonetheless, when we dance together we really get lost in each other. We become one. So the public sees a sincere and pure devotion between us, and a fragility that comes from unveiling our inner selves to each other in a simple, natural and spontaneous way. This is your very first work with your own company. Why did you decide to premiere it in London instead of in Buenos Aires? London has always brought a lot of satisfaction to my career over the years. The love from the audience in each performance, the warm welcomes I’ve had, and the constant support I’ve received from Sadler’s Wells – these have all been incentives for me to schedule the world premiere of Immortal Tango in this city. You are making a name for yourself as a leading UK ambassador for tango. Is there a big tango scene in London? There’s lots of tango in the UK! Not just in London, but all over the country. There’s a well-informed audience here that is well versed in tango. And there are many great tango teachers too. What dance training have you had in your life? And what do you think are the main skills that a tango dancer needs? Aside from tango, I’ve trained in classical dance, jazz and contemporary dance. I think that to be a tango dancer you need to have sensitivity, the ability to connect with someone through an embrace, a musical ear, rhythm, fluidity and respect for others. You were one of the original dancers to work on milonga, the Sadler’s Wells production by choreographer Sidi Larbi Cherkaoui, which is still touring the world. What was it like working with him – and did you enjoy fusing contemporary dance with tango? Working with Sidi Larbi is an enormous pleasure. He’s an incredible artist and has an immense ability to transmit his ideas and construct new worlds. In milonga we really enjoy taking our art to the new territory of contemporary dance, through the investigation and deepening of both genres.